The Pure Destiny Sulphate Free hair care products contain 100% pure essential oils and are free from the harsh chemicals typically used by commercial manufacturers. Our Soy Protein Conditioner-This natural product soothes, moisturises, conditions and restores the hair and scalp to its natural balance. The secret ingredient is a herbaceous blend of Lavender, Sandalwood and Frankinscense essential oils, which has been chosen for it's restorative and healing properties. 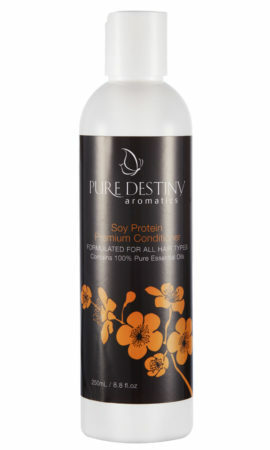 The Soy Protein Conditioner contains a range of amino acids which are highly recommended for those with skin complaints including psoriasis, flaky scalp, dermatitis and other irritations. Perfect for daily use for the whole family.